The Church History module of RESource assists Religious Education teachers to find reliable online resources to help them prepare and present lessons and lesson sequences in the study of Church History. It is constructed in such a way so that teachers can see a logical progression in the study of various aspects of church history, and also see how valuable a historical perspective is in understanding the Church in the present day. An illustrated chronology (yet to be developed) will introduce s the Church History module . It showing shows key events and people from the time of the apostles and the early church through to modern times. The Church History module is made up of six categoriess; five dealing with chronological eras and one devoted to the history of the Catholic Church in Australia. These are Early Church, Medieval Times, Renaissance and Reformation, Early Modern Church History, Twentieth Century Church History andAustralian Church History. Within each category there are various topics. Some of these take a broad view, examining large movements with many effects and implications for human society and the Church, e.g. Luther and the Beginnings of the Reformation. Other topics will be more local in scope, e.g. the History of Catholic Education in Australia (coming soon). Naturally it will be sometime before this The Church History part of RESource is yet to be fully developed. Each object topic in the Church History opens with a snapshot which highlights some key points. Then, using the internet as a tool, the topic is developed in five stages which examine context, characters, events, and consequences leading to an exploration of the topic’s impact in our own time. There is an enormous amount of primary source material available on the internet, which makes it a great resource for learning. However, many sites are fairly challenging for students, particularly in the junior and middle years. RESource hopes to help teachers work with these primary sources as well as directing them to secondary sites that are (if not always impartial) fair and balanced in their commentary on history. Many sites provide access to excellent online learning but, as always when using the Internet, be care ful should be taken in selecting sites to ensure that an evaluation of their authenticity, reliability and quality has been undertaken prior to their use as a resource with students. A useful rule is to a void any site whose purpose seems to be to stir up antagonism, dislike or distrust. The Internet for Religious Studies site has a fine section advising Internet users on ways to identify reliable sites. In addition it is necessary to read some reputable histories and introductions to the topics you will be teaching. This is important because it will familiarise you with both the subject matter and with some of the critical questions around it. Moreover, reputable books on history go through a process of screening, editorial comment and correction that websites do not. There are no comparable checks and balances on material posted on the internet, and it is difficult to judge the reliability and worth of online data unless you have some background in the subject matter. On the front page of each topic arena there is a Core Resources section which contains general history materials. This section is organised under a series of headings. An introductory article explains Why Church History is Worth Studying. Using Primary and Secondary Sources recommends a couple of sites which explain how to work with historical source documents. Sources and Sourcebooks directs teachers and students to online texts that are relevant to their studies. Timelines points to three or four chronologies already on line . Background and Introductory Sites directs searchers to any good general historical sites relative to the topic but not specifically about it. Each topic is introduced by a trailer ‘snapshot’ or some photographic material intended as introductory stimulus material, and occasionally as a help to reviewing work. Provides background to the particular historical topic/era being studied, putting it in its social, cultural and religious context. Looks at the lives of key people who played a significant part in the unfolding history of the period/movement. The section which tries to ‘get the facts straight’ about events, while appreciating that history is a interpretative discipline and always reflects the response of its recorders as well as what actually happened. Examines the long term effects of events, persons or schools of thought, particularly the impact felt in our own time. Evaluation and application, the ‘so what?’ of history, is important in this section. A very readable article on the St Mary’s Press site provides a rationale for the study of Church History of any era. Creighton University in America has produced very rich resource on the Second Vatican Council which includes overview articles as well as individual contributions by scholars and a study guide. Challenge, Change and Faith is a DVD produced in Melbourne exploring the impact of the Council in Australia. It explores the Australian Church prior to the Council and uses interviews with many Catholics lay and ordained to reflect the effects of the Council on the local church. The Australian Catholic University’s Ecclesiology: A Study in Church History has a useful list of images of the Catholic Church prior to and succeeding the Council which is helpful for gaining a sense of the ways in which the style and emphasis of the Church changed as a result of Vatican II. Among the best collections of historical sources on the Internet is Paul Halsall’s History Sourcebooks and the one most relevant to the study of Luther and Reformation history is the Modern History Sourcebook. The vital primary sources for the study of Vatican II are the sixteen documents of the Second Vatican Council. Timelines are a useful tool for a ‘bird’s eye view’ of the history of the church. Unfortunately there is no onetimeline that does justice to the history of Christianity. However a look at several fills out the whole picture a little better. A good place to start is with the Tredway family chart of the history of Christianity. It is very well arranged with enough detail to orientate people new to the study of church history but it does not really give an adequate picture of Catholic church history after the reformations of the fifteenth century. 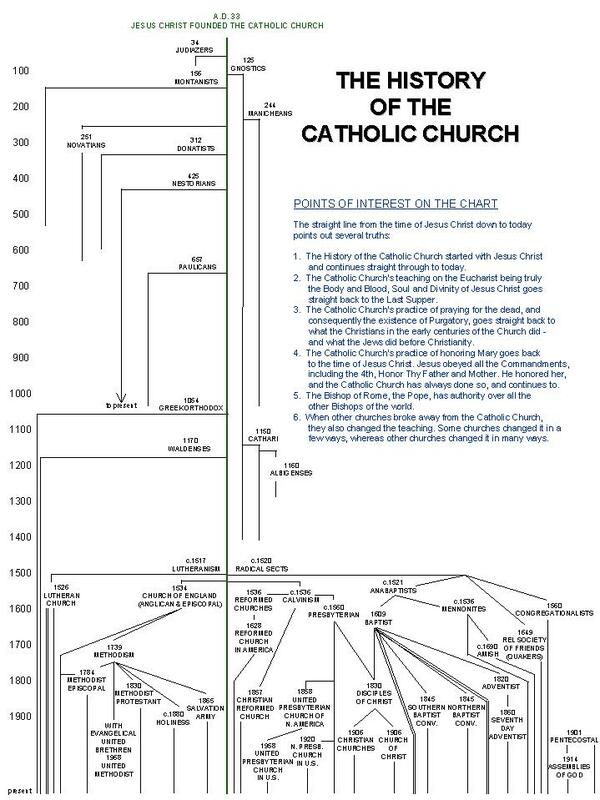 A diagrammatic timeline is handy for a one-glance-look at how Christianity has evolved but the brief commentary is Catholic triumphalist in tone. Another ‘single glance’ site is presented from the Orthodox point of view. None of these sites are entirely satisfactory but together they provide a reasonable outline of the history of the church. The Archdiocesan Office for Youth have an excellent and detailed biography of Saint John XXIII. Section One contains information on his virtues while Section Two looks at St John XXIII call to renew and update the Church in Christian unity through the Second Vatican Council. American Catholic has an excellent brief biography of Saint John XXIII. It includes John’s own assessment of how he could become a saint. You could also look at the topic of Vatican II in this module for several biographies and/or assessments of the life and work of this great 20th Century Pope.